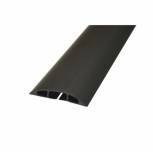 D-Line Black Light Duty Floor Cable Cover 60mmx1.8m Long CC-1 Pack of 1 Light duty cable cover, tapered to prevent trips and protect cables. Split back to insert cable. 80mm wide with 14x8mm cavity for 2x 8mm flex cables. 1.8m long: can cut to size. Colour: Black. 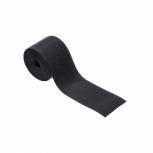 D-Line Black Medium Duty Floor Cable Cover 9m Long 83mm Wide FC83B/9M Pack of 1 Medium duty cable cover. 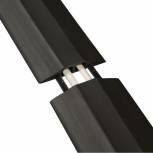 83mm wide with 30x10mm cavity for 3x 8mm flex cables. Split back to insert cable. 9m long - includes linking strips to join covers together. Non-slip backing: no need for tape. Colour: Black. 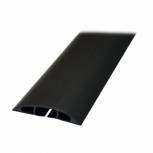 D-Line Black Light Duty Floor Cable Cover 80mm Wide 9m Long CC-1/9M Pack of 1 Light duty cable cover, tapered to prevent trips and protect cables. Split back to insert cable. 80mm wide with 14x8mm cavity for 2x 8mm flex cables. 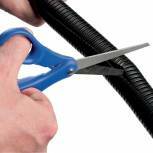 9m long: can cut to size. Colour: Black. 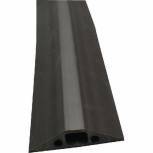 D-Line Black Medium Duty Floor Cable Cover 9m Long 68mm Wide FC68B/9M Pack of 1 Medium duty cable cover. 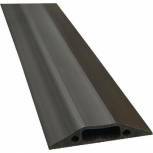 68mm wide with 14x10mm cavity for 2x 8mm flex cables. Split back to insert cable. 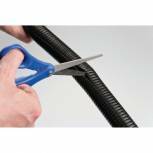 9m long - includes linking strips to join covers together. Non-slip backing: no need for tape. Colour: Black. 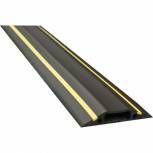 D-Line Black /Yellow Medium Hazard Duty Floor Cable Cover 9m FC83H/9M Pack of 1 Medium duty cable cover. 83mm wide with 30x10mm cavity for 3x 8mm flex cables. Split back to insert cable. 9m long - includes linking strips to join covers together. Non-slip backing: no need for tape. Colour: Black with yellow hazard stripes. 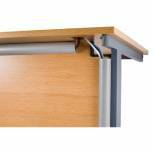 D-Line Silver Desk Trunking Cable Management 50x25mm 1.5m (Pack of 2) 2D155025A Pack of 2 Desk trunking for cable management. Tidy wires for a smart, safe environment. 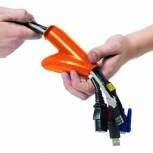 Insert and remove cables with click lock lid. 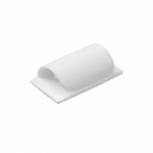 Adhesive backing - no tools required for installation. 50x25mm cross section. 1.5m long - can be cut to length. Colour: Silver. 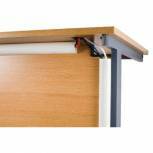 D-Line White Desk Trunking Cable Management 50x25mm 1.5m (Pack of 2) 2D155025W Pack of 2 Desk trunking for cable management. Tidy wires for a smart, safe environment. Insert and remove cables with click lock lid. Adhesive backing - no tools required for installation. 50x25mm cross section. 1.5m long - can be cut to length. Colour: White. 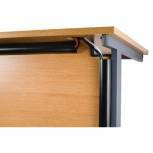 D-Line Black Desk Trunking Cable Management 50x25mm 1.5m (Pack of 2) 2D155025B Pack of 2 Desk trunking for cable management. Tidy wires for a smart, safe environment. 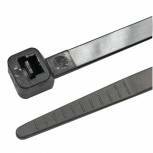 Insert and remove cables with click lock lid. Adhesive backing - no tools required for installation. 50x25mm cross section. 1.5m long - can be cut to length. Colour: Black. D-Line Cable Tube 25mm diameter Black 1.1m (Pack of 6) CTT1.1B/6 Pack of 1 Cable tidy tube. Flexible for easier use. Pre-split for adding/removing cables. Requires no zip up tool. Colour: Black. Diameter: 25mm. Length: 1.1m. 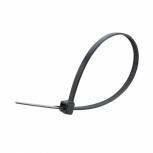 D-Line Cable Tube 32mm diameter Black 1.1m (Pack of 6) CTT1.1B/6 Pack of 1 Cable tidy tube. Flexible for easier use. Pre-split for adding/removing cables. Requires no zip up tool. Colour: Black. Diameter: 32mm. Length: 1.1m.